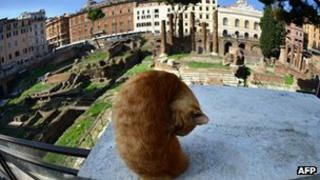 There is growing pressure on a well-known Roman cat sanctuary to leave its home in the heart of the ancient city. The head of Rome's archaeological office says parts of the sanctuary have been illegally built on a heritage site and must be pulled down. Rome is well-known for the stray cats which live among its archaeological splendours. The animals are much photographed by tourists but Mariarosaria Barbera, the Special Superintendent for the Archaeological Heritage of Rome, has told the Repubblica newspaper: "While we love the cats almost as much as the ancient monuments, the sanctuary is an illegal construction. "We object to illegal building on a heritage site." Mrs Barbera said her office had been trying to find a solution to the problem for the past two years. She said she was trying to secure a meeting with city authorities to find an alternative home for her sanctuary, which has become a tourist site in its own right.